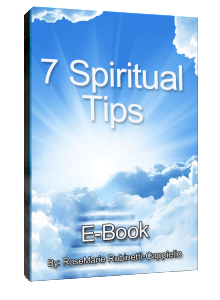 Register Now To Receive My 7 Tips E-Book, FREE! This channel offers a spiritual perspective on life, death, life events, world events, the mental, emotional and physical aspects living beings encounter and insights into all the areas we as humans deal with — health, relationships, work and finances. It is designed to uplift and offer comfort and wisdom to all those who watch/subscribe. Each month, I will offer an energy alert, sort of like a psychic forecast to help us navigate and work with the energy currents present at the time. These alerts are practical and grounded in solid terms helping us to understand from a higher perspective (from an energetic perspective) what we may encounter and experience and how we can work with that for our highest potential and greatest peace. Hope you join this spiritual community and begin understanding your own life from a much deeper level. Let us each create our own peace filled life and then we create a peace filled world. Have You Read Our Great Selling Book? Subscribe To Our Online Spiritual Community Now Only $30/Month! Membership Has It’s Privileges! See Why It Pays To Be Part Of Our Spiritual Online Community! Private Registration Link only available to Subscribers. Immediately after each meeting, automatically receive the uncut versions of each online class . Receive all the unlock codes to all 2015 edited online classes PLUS access to all 2016 and 2017 classes. Stop or pause your subscription at any time, for any reason. And best of all, lock in your rate for LIFE! Curious As To What Intuitive Mediumship Is? Learn More In 4 Short Minutes. 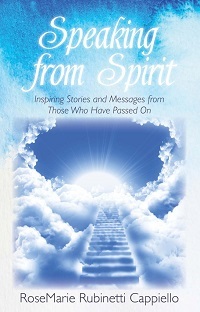 RoseMarie Rubinetti Cappiello is a published author, Intuitive Medium, Yoga Instructor (since 1989), Ordained Spiritual Minister, Hypnotherapist, Hospice Grief counselor/volunteer, Reiki attuned, and a BS Physical Education MSU. I was not always psychic/intuitive. In 1995, I was in a car accident where… read more.